Small form factor machines are definitely not new, and they happen to be extremely popular thanks to their extremely tiny size, allowing them to fit into just about any apartment or small living space, not to mention make a whole lot more room at the office, where space too, is at a premium. All of this without having to sacrifice too much in terms of performance, which is a good thing. 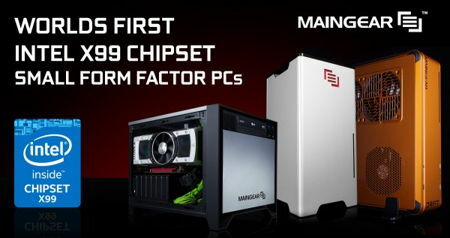 Having said that, Maingear has just introduced what they believe to be the very first X99 small form factor gaming machine in the whole world. Just like how we are told not to judge a book by its cover, so too, should we not judge a gaming machine or system by its size. With the Maingear X99, it will be powered by Intel’s X99 chipset Intel Core i7 extreme edition processors, now how about that? Specially designed in order to deliver unmatched performance in full-sized desktops, Intel’s X99 chipset can now be found in Super Stock editions of the compact POTENZA with VRTX cooling, in addition to the STEAM-ready DRIFT that shares a size which is not too far away from that of a console, as well as the fully custom liquid-cooled ultra-compact TORQ. Each of these desktops happen to be fully customizable, and they will arrive standard with liquid cooling, and will be available in Maingear’s true automotive paint finishes. The Intel X99 chipset itself will be able to deliver massive gaming output, despite coming in a small form factor, thanks to the support of up to an Intel i7 5960X 8 core hyper threaded processor and ultra-fast DDR4 memory. It will also play nice with all Haswell-E Intel Core i7 processors with Intel Turbo Boost Technology 2.0, allowing one to enjoy overclocking for even faster speeds, as well as having an array of speed boosting features that have been specially designed to maximize performance.